Personality: Carefree and random, wild and fun-loving, yet he rather be safe than sorry above all else. Has a bad habit of speaking without thinking, and tends to start going on and on about things when nervous, sometimes even having trouble himself keeping up with his own mind. Even with his laid back attitude, it’s mostly a cover up to his more paranoid and overdramatic self. He can go from an over the top optimist to a depressed pessimist. While he may act and claim to only care about his own well-being and comfort, he has on more occasions showed to have a softer side where he’s unable turn his back on someone needing help, even while he’s most likely to turn tail and flee when trouble arises. Though he may not be the most intelligent or observant type, he understands and knows way more than he lets on. Notable Attributes: A serious case of having ‘sticky fingers’, doesn’t realize himself half of the time when he steals something, no matter how much he tries not to. 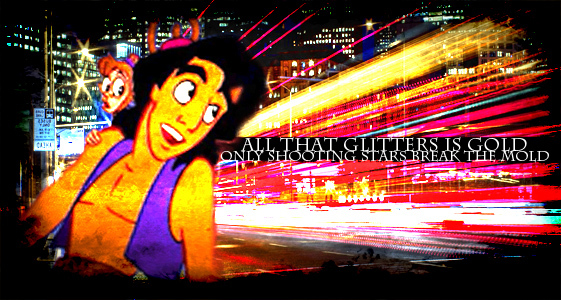 History(if any): Most part of his childhood, Aladdin either grew up in an orphanage or foster families. Whenever he would be left in the care of foster parents, they’d either sent him back to the orphanage or he’d run away. He grew tired of this ‘routine’ at a pretty early age, and decided he was better off on the streets on his own. For the most part, he only stole what was necessary for him to survive, but that didn’t hold him back to sneak away with stuff he only happened to like. The older he grew however, the less he started to care about what he stole and learned to enjoy every little thing he came by and achieved. He was always on the move, moving from one place to the other and never staying too long in the same place. He’d get jobs sometimes, all from odd ones and little less than dangerous, anything to keep him going. Even though he at times wished he could have a real place to call home, with the same people waiting for him and a non-risky life style, he still enjoyed the freedom and privilege his way of life gave him now. Until he got caught that is.